The Conservation College Wilderness Skills Training Intensive will be our primary summer residential program in 2020. If you want the fastest path to wilderness proficiency through a wide array of outdoor skills, this is the experience for you. Kim & Chris Chisholm will guide you through this experience alongside veteran faculty and staff as you gain wilderness skills in a fast-paced, outdoor setting. Our goal is to ensure that by the end of the summer you have the skills, knowledge and experience needed to thrive in any outdoor situation. 2020 Dates will include June 12 – Sept 5 plus complimentary early summer arrival and late extension into the fall in exchange for work-trade and employment opportunities. Start at our home base of Blue Skye Farm in Puyallup, Washington, and spend much of the summer at Lake Sammamish with periodic travel into the Cascade Mountains, Sagebrush Canyonlands, and to the Salish Sea. We will have 8 positions available, so apply by December 30th for the best acceptance opportunity. Total cost including everything – tuition, food, facilities, gear, books, transportation between courses, etc. – normally ranges from $3k-$6k depending on previous experience, and often leads to employment with us in the fall and next summer. The cost is equivalent to tuition for eight Summer Training Weeks at a discount $600/wk for assisting with camp chores, and four independent study mentoring weeks at a $300/wk rate. Discounts are also granted for past trainings and experience, thus up to 50% off the $6,000 tuition with complimentary mentoring through Wolf Journey field exercises, basic food and facilities, etc. all provided throughout the summer, with the expectation that participants are work-trading for those benefits by contributing equally to community chores on the farm and at camp. 2016 Intern-Apprentice Sarah Inskeep at her study site on the barn roof where she always watched the sunset and kept an eye on the burgeoning wildlife in restored wetlands. Food Shopping & Kitchen Work-Trade Opportunity Still Available: If you enjoy cooking, and/or don’t have the funds to enroll in the Wilderness Skills Training Intensive, then you can apply for one of two work-trade positions in exchange for tuition. You would gain a good introduction to earths skills education over the summer, but also be busy shopping on weekends, rising early to start breakfast Mon-Fri, cooking dinner from 3:30-5:00 Sun-Thurs, and taking turns with other staff to clean up after meals. To apply, follow the same steps as for all our summer residential training programs, including $200 application fee, but also include answers to the 8 financial aid questions found on our Max Davis Scholarships application page. If selected, you will have no additional costs throughout the summer, except $200 for Wilderness First Aid training if not already certified. You will need backcountry gear like good waterproof hiking boots, large backpack, camping stove, tent, etc. so check out our Summer Expeditions Packing List and request access to the Backcountry Leadership Training gear list which is all you’ll need during the summer, plus a simple laptop (chromebook is fine) for recording your progress. You shouldn’t have to spend an additional dime after arrival except for personal variables such as health care and insurance, smart phone and personal vehicle expenses if have you one or both of those, and weekend entertainment if you so choose. You’ll also have free access to books and field guides in the Conservation College library. To get a sense for the summer, we recommend you talk with apprenticeship graduates about their experience. Just email us with a request to get in touch with graduates of your choice. We have 8 positions available, so apply by December 30th for the best acceptance opportunity. We will provide an exact price quote after reviewing your application listing your past outdoor, academic and work experiences. In comparison to the Earth Skills Teaching Apprenticeship, the Wilderness Skills Training Intensive: 1) diverges during the second half of the summer from the apprentices who will focus on teaching the outdoor skills, while you would continue focusing on practicing skills with fellow adults; 2) is a complete overview of wilderness skills, whereas teaching apprentices may not get a chance to learn some skills you experience later in the summer, such as certain artisanry skills or subsistence fishing, for instance; 3) has fewer expectations on personal behavior such as smoking and drinking which is fine outside of camp hours if legal and safe, not getting drunk or noticeably high, etc. ; and 4) requires no previous experience, education, or training, whereas acceptance into the apprenticeship program has greater qualification requirements. That said, if you are interested in the teaching apprenticeship instead, there are some who were accepted with no formal experience, but who had simply spent so much time outdoors in their childhood and/or young adult years, that they were often more prepared than others with academic training. If you are unsure as to whether you qualify for the apprenticeship or just want to do the Wilderness Skills Training Intensive, simply follow the application steps which include a conversation with program directors, and we will let you know whether you are eligible for one or both. Close-up of apprentices and youth mentors during the 2016 Backcountry Leadership training including from left-to-right Frida Cruz, Elissa Pemberton, Wren Schmid, Lee Forrest, Sarah Inskeep, Marie Ranney, Jacob Gerstman, Director Chris Chisholm, Thomas Fellows. June 12 optional early arrival to get settled in and help with Orting Farmers Market. Evening campfire with other apprentices and staff. June 13 optional Meeker Creek Restoration Work Party, jump start on Wolf Journey Earth Conservation Course independent study field exercises, and evening campfire with other apprentices and staff. June 14-19 options including mentoring through Wolf Journey field exercises, with room and board also provided in exchange for 2 hours/day of work trade getting ready for summer camps and helping farm interns, a chance to gain sustainable agricultural training. For those not already certified, we will host Wilderness First Aid, CPR-AED, and optional Hunter Education if initial online course completed by this date, as well as complimentary flintknapping with a guest instructor on Friday afternoon before our evening solstice campfire. 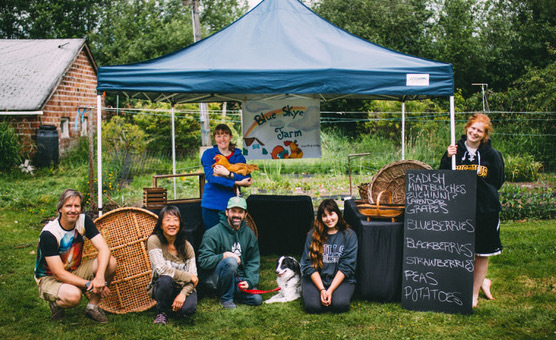 June 20 Workshop: Sustainable Home & Gardens – Living on an Acre which is a great orientation to the conservation philosophy of Blue Skye Farm, home base of Wolf Camp and the Conservation College. June 27: Wolf Journey field exercise and journaling of lessons learned on Backcountry Leadership expedition, and prepare for the following week. June 28 – July 3: Teaching Nature Professionally including participation in our Family Classes. July 6-10: Visit study site or make breakfast from 7:00-8:00. Breakfast from 8:00-9:00. Meet with Wolf Journey mentor from 9:00-9:30. Practice skills or assist instructors at wilderness survival, ethnobotany, or wildlife tracking day camps from 9:30-3:30. Wolf Journey field exercise journaling or make dinner from 3:30-5:00. Dinner from 5:00-6:00. Visit study site or practice skills from 6:00-8:00. Campfire music and sharing study site stories from 8:00-9:00. Apprenticeship graduates Heather Carmichael and Wren Schmid at the 2016 Ancient Archers & Artisans traditional technologies training. July 12-17: Sunday Lunch Meeting 12-1. Pack for the week from 1-2 and travel to course location from 2-3. Help set up camp from 3-4 and greet participants from 4-5. Dinner from 5:00-6:00 then start of then start the Wilderness Survival Training & Trek. Attend week-in-review meeting on Friday evening. July 18: Wolf Journey field exercise and journaling of lessons learned at Wilderness Survival expedition, and prepare for the following week. July 19-24: Sunday Lunch Meeting 12-1. Pack for the week from 1-2 and travel to course location from 2-4. Help set up camp from 5-6. Dinner from 6:00-7:00 then start the Tracking Wolf Country – Birds to Bears expedition. July 25: Wolf Journey field exercise and journaling of lessons learned at Wildlife Tracking expedition, and prepare for the following week. July 27-31: Visit study site or make breakfast from 7:00-8:00. Breakfast from 8:00-9:00. Meet with Wolf Journey mentor from 9:00-9:30. Practice skills or assist instructors at wilderness survival, ethnobotany, or wildlife tracking day camps from 9:30-3:30. Wolf Journey field exercise journaling or make dinner from 3:30-5:00. Dinner from 5:00-6:00. Visit study site or practice skills from 6:00-8:00. Campfire music and sharing study site stories from 8:00-9:00. Crop of apprentices and youth mentors at Olympia scout camp 2016 including from top left graduate Wren Schmid, top center graduate Drew Basham, top right mentor Jackson Fellows, and bottom center graduate Jacquelyn Kellin. August 2-7: Sunday Lunch Meeting 12-1, Wolf Journey field exercise and journaling from 1-4, greet new participants or prep dinner from 4-5, dinner from 5-6 then start Scout Philosophy & Mentoring course. Attend week-in-review meeting on Friday evening. August 8: Wolf Journey field exercise and journaling of lessons learned at Scout Camp, and prepare for the following week. August 9-14: Sunday Lunch Meeting 12-1, Wolf Journey field exercise and journaling from 1-4, greet new participants or prep dinner from 4-5, dinner from 5-6 then start Wild Cooking & Herbal Medicine course. Attend week-in-review meeting on Friday evening. August 15: Wolf Journey field exercise and journaling of lessons learned at Wild Cooking & Herbal Medicine expedition, and prepare for the following week. August 17-21: Visit study site or make breakfast from 7:00-8:00. Breakfast from 8:00-9:00. Meet with Wolf Journey mentor from 9:00-9:30. Practice skills or assist instructors at wilderness survival, ethnobotany, or wildlife tracking day camps from 9:30-3:30. Wolf Journey field exercise journaling or make dinner from 3:30-5:00. Dinner from 5:00-6:00. Visit study site or practice skills from 6:00-8:00. Campfire music or sharing study site stories from 8:00-9:00. August 23-28: Sunday Lunch Meeting 12-1, Wolf Journey field exercise and journaling from 1-4, greet new participants or prep dinner from 4-5, dinner from 5-6 then start Traditional Tech: Craftwork of the Ancient Artisan course. Attend week-in-review meeting on Friday evening. August 29: Wolf Journey field exercise and journaling of lessons learned at Artisan Camp, and prepare for the following week. Aug 30 – Sept 4: Sunday Lunch Meeting 12-1, Wolf Journey field exercise and journaling from 1-4, greet new participants or prep dinner from 4-5, dinner from 5-6 then start Subsistence Fishing Camp. Attend week-in-review meeting on Friday evening. Sept 5: Morning meeting and journaling of lesson learned at Fishing Camp, afternoon cleaning and re-organizing camp gear, and evening apprenticeship graduation campfire celebration. 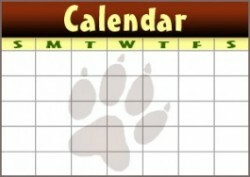 September: Optional Trips to Vision Quest & Hunting Camps, Rabbitstick Rendezvous, Wisconsin Wolf Cabin. Former homeschool class participant and 2016 Apprentice Kyler Shumaker back in the day building rock cairn during survival training. No matter your previous experience, you will be expected to fully participate in every possible summer opportunity to push your skills to a higher level of excellence, although your own health will be the priority while developing into better and healthier wilderness skills practitioners. By the time you complete the course, you will become a key resource on the natural world for your community, probably the best expert on habitat conservation in your neighborhood, and you will know how to help people make footprints on the earth as light as possible as we create the future for humanity and all its relations. 1st Priority: Develop a working knowledge of all wilderness skill categories. 2nd Priority: Take care of yourself, while nurturing fellow students and supporting other staff. It is important that you come into the program as healthy and prepared as possible, for although during the training portion of the program your educational needs are the focus, during the summer camp season, the needs of the children take center stage, so you will have to be self-motivated when your program mentor is off-site, and remain healthy amongst constant camp activity. 3rd Priority: Learn to share wilderness skills with others. One of the best ways to become skilled is to observe, participate in, and take notes on all the activities our instructors present over the summer. The opportunity to assist lead instructors and take on instructional leadership yourself during the summer is a great way to fully embody your own wilderness skills. 2016 Wolf Gathering 20th Anniversary Kick-Off Celebration with 2016 Apprentice Sarah Inskeep; Apprentice-Turned-Instructor Hannah HP; Coordinator Kim Chisholm; and 2016 Apprentice Wren Schmid. Most of our staff came on board via our summer residential programs, while others enrolled to receive training in order to found their own schools or gain experience for employment elsewhere. 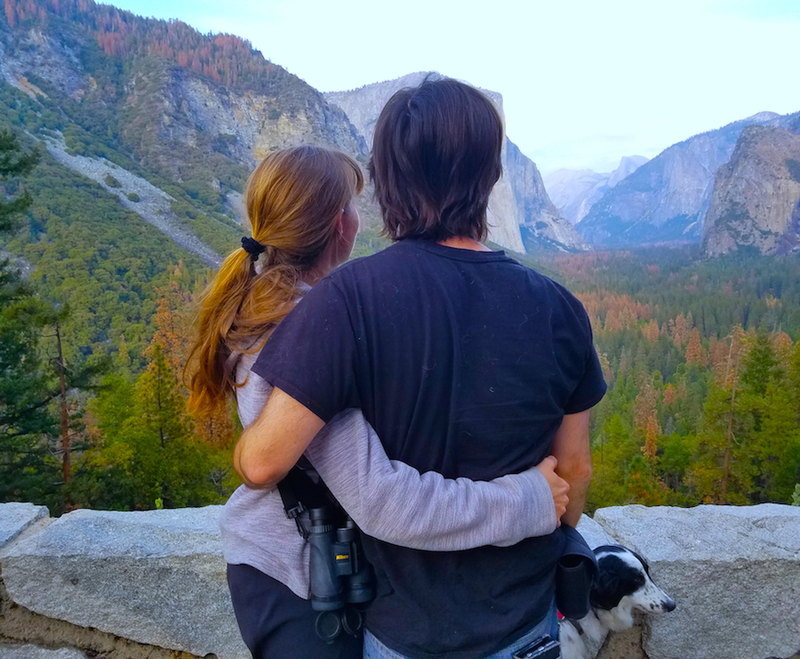 Benefits of this program include eligibility for employment at Wolf Camp, strong recommendations for employment elsewhere, and advice for starting your own guiding programs. Some might think that not spending any money all summer, and often starting to get paid over time is the bottom line benefit, but the real benefit is your transformation into an excellent outdoor practitioner, ready share your skills wherever organizations and agencies need qualified experts. Click here for additional FAQs. We have 8 positions available, so apply by December 30th for the best acceptance opportunity. We will provide an exact price quote after reviewing your application including past outdoor, academic and work experiences.